The situation is very simple, you are away from home (imagine visiting a friend or being at work), but you desperately would like to access your internal LAN FTP/Samba/etc… , but you do not have with you your own notebook or any device with a VPN capability to tunnel to your home securely. So what to do ? You do not really want to open your home firewall and NAT whole internet to the internal PC or server on your LAN. Lucky for you, there exists a trick under a name of “port-knocking” where you can send to your home firewall a sequence of TCP or UDP packets with specific ports (the ports act as a password) and your home system can temporarily open the firewall and NAT to only your source IP from which these packets arrived. 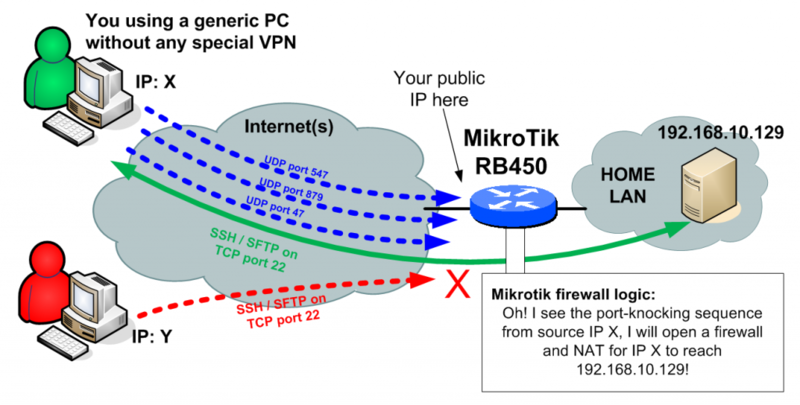 In this quick example I will show you how to do this on Mikrotik (where I do this for several years now) and I will point you to generic linux tutorial for the same using iptables in links below. Target: I want to access my home linux server for SSH and more importantly SFTP, which is running on LAN with IP 192.168.10.129. Port-Knocking sequence I want: 547, 879 and 47 in TCP packets will open the access. Extra restriction: After successful port-knocking, only allow access for new SSH/SFTP sessions for 15min, but do not break established session until it disconnects itself normally. Implementation, is quite simple and I will split it to few steps. Explanation is that this NAT rule and firewall rule only works for source IPs (the IP X in our example) that are part of the PORTKNOCK_ALLOWED list. Also note that I moved the NAT to allow TCP 2222 as an alternative to using the native 22 which is reserved for the router itself, so when I will connect to the internal server from internet, I will use the port 2222. Explanation is that you need three rules in a reverse order adding the IP X to a list. When the first UDP 547 arrives, the 3rd rule will put it to PORTKNOCK_STAGE_1. When the next UDP 879 arrives and it is already in PORTKNOCK_STAGE_1, it will be put also to PORTKNOCK_2. WHen the last UDP 47 arrives and the IP X is already in PORTKNOCK_2, it is added to PORTKNOCK_ALLOWED for 15minutes (you can notice the previous stages only have 20seconds timeout). NOTE: if you are using windows 7, you have to manually activate telnet in the windows components, just google this part, there are just too many guides for this out there. There also exist port-knockers for windows with identical functions, but I will leave to you to find one that suits your needs. I also use a port-knocker on my iPhone called KnockOnD, so you can imagine how relatively easy and wide-spread the port-knocking is. PS: The public IPs used in this example are random IPs, I didn’t published here my real IPs 😉 Just FYI.